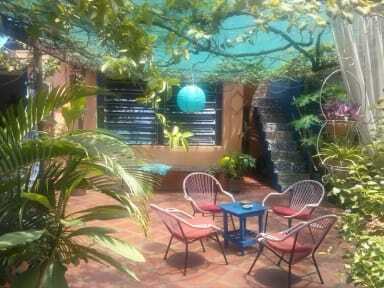 Welcome to the very first Eco-hostel in Asunción that is using some energy coming from solar panels. The ambience of this place goes beyond self-interest of only business finding a place to relax and have fun if you want. 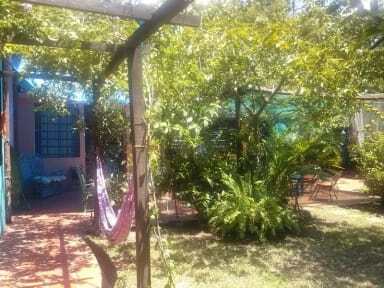 This places offers a cosy and colourful hostel located smack in the historical centre of Asuncion. Surrounded by fruit trees, birds and plants, you will find out its possible to find an oasis right in the city centre. We are situated one block (100 m) away from the most popular bars in microcentro - 'Britannia' and '904'. And within walking distance of all the major historical sights and hot spots. Read a book, have a cold drink or enjoy the company of other travelers in our beautiful, spacious garden. You will find plenty of cosy spots around the premises to chill out. Owned by a Paraguayan/Swedish couple. Together we visited all 13 countries in South America by road we assure you knowledge, not only about Asuncion and Paraguay, but on many of the places you want to see in South America. Credit Cards Not Accepted: Only cash accepted on arrival. I stayed at El Jardin 4 years ago (2015) and I had a great experience and now in (2019) I have had a similar experience, an inviting envolving vibe that existed then, still exist now. I loved the hostel and the people there. Because most people at the hostel were staying in Asunción for a while it had a special vibe. It felt more like a community and not just people passing through quickly. Liked the garden too, very chill! Cool atmosphere at the Hostel with friendly & welcoming staff - nice courtyard communal area, with a pool. Good selection for Breakfast too. Thank you! Small friendly hostel, everybody knows everybody almost. Swedish owner. Good vibe with guitar music and a good kitchen. Lovely hostel with great staff and cool atmosphere. One aspect that could be improved is the quality of the beds and linen. Mattresses were a bit hard and pillow cases really worn. Beds and pillows are comfy, with good air con. However, the staff took my sheet after the first night, I assume accidentally, and we often had to chase them to put the air con on. Busy hostel, plenty of atmosphere. Parties every night we were there, great if you want to join in. Terrible if you don't because there is no consideration for anyone else, very noisy and people going in and out of dorm till early hours of the morning. Cleaned everyday! Security door. Simple breakfast. Friendly staff. Toilets smell horrible! 2 days without pool because they didn’t know how to clean and we couldn’t use it at all! The pool is the best thing of this hostel. This hostel is one of the worst I have stayed in. The staff have this attitude that they are the best when they are actually the worst. There are more staff here than guests staying and have this superior attitude. Why, I dont know, you have to ask a Paraguayan. I have been around the world twice and this place is the worst. Please go someplace else. The staff are only interestd in screwing the foreign girls. By far the worst hostel I have ever stayed at! The first night I had water dripping on me from the ceiling. The second night my friend had someone sleeping in his bed and the two staff on duty just laughed at the situation. I woke up covered in bites which seemed to be bed bugs as I counted 30, the woman was even putting powder on the mattress which is used to kill bed bugs! I then asked the woman and she told me I was allergic to the heat or food! The breakfast was hard donuts and cold coffee.